This native snail species is quite large, its shell reaching a diameter of up to 56 mm. The shell ranges from a tawny yellow to dark brown base-colour with many black spiral bands and a dark area behind the outer lip. Being quite rounded in shape, it also has an elevated spire and a bluish black lip. The animal is a dark grey to brown colour with a grey mantle. 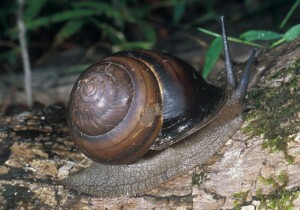 Fraser’s Banded Snail can be found living under logs and rocks in rainforest, closed woodland and in some suburban areas that are adjacent to wet forest patches. It occurs from around the Clarence River region in northern New South Wales northwards to about Gympie in south-eastern Queensland.